The beta program 6 was closed. The release version is available in the download section! SiDiary 6 for free - how does it work? With the release of SiDiary version 6 SINOVO offers the basis version with some functional limitations as a free-of-charge product again. You can use this product with all functionalities of the free-of-charge version without paying a licence fee! The free versions (online, PC, Apps) are containing advertising pop-ups in the 'adware modus' and you can use some of the functions only in limited ways. You can use for example all device imports in the free adware version - but you can only import the last 7 days in this version. If you want to synchronize data between several platforms (Smartphone Apps, Online, etc.) - you can also synchronize only the last 7 days. To offer our brand new product again as a free version is a logical step in SINOVO's product policy. 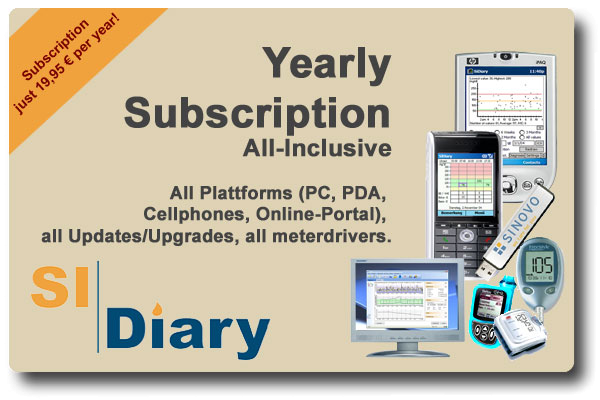 From the beginning of SiDiary we always offered a free-of-charge product version! We want to make sure that everybody is able to use SiDiary - even if the licence fee would be a problem in individual cases. With the free-of-charge modus of SiDiary - which is sponsored by advertising - our advertising partners are sponsoring the end users and help to finance at least a small part of the usual licence fees. If you wish to place an ad within the program SiDiary (and therefore for a very clear cut target group), please do not hesitate to contact us. Below you can see advertising examples. The examples show how our software would show the ads (even on mobile devices such as Smartphones).